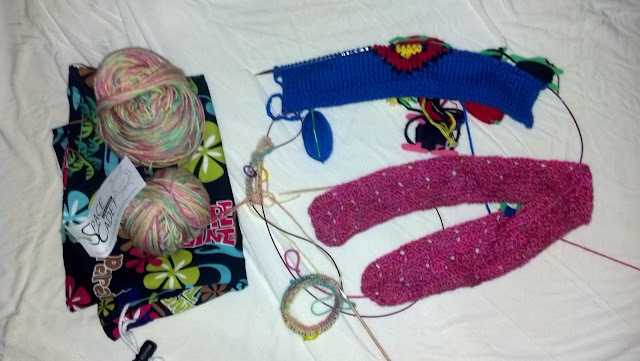 Amaryllis Musings: WIP Wednesday - Super Azalea Socks? WIP Wednesday - Super Azalea Socks? I know you all may not realize it but I try and come up with nifty titles for each post. It's my little trailer to my post and I want you be intrigued to read this instead of hitting skip in your reader. That said, I admit this one while intriguing is just a mash up of objects I am working on this week. Really, I think that I may actually have a post each day of the week this week so my creative snark is a little depleted. Anyway, make sure you check out my commercial debut for Math + Science = Success that I posted yesterday and I have a long long awaited FO on Friday. So now that we have caught up, let's get to the yarny goodness! I didn't get individual shots but here is what I have been working on. Usually these squares are done within a weekend and I move on but this one has challenged me. There are a lot of color changes and color blocks. I started this initially back in August but didn't like where it was going and ripped it out. I am back to the point where I ripped it out and have restarted it for the next go round of Nerd Wars. I am relieved that its going better not great but better. I think once I get past the fiddly bottom of the S finally, I will be okay. Keep your Fingers Crossed please! I finally started this shawl/blanket. I had the swatch done forever ago but just needed the right push to get things going. I had to make a chart to show where the stitches went. The pattern is quite clear but I just could not picture it in my mind where everything went. The chart is a huge lifesaver! Anyway, I am plugging along and can't wait to see it completed. Mel over at SingleHandedKnits had a great idea to have a KAL for the elections and created Sock the Vote and asked Indie Yarn Dyers to create specific colors ways for Cuff Down socks, Toe Up Socks and the Undecideds. I have a bit of a connection to both dyers (SpaceCadetCreations and Yarn-vs-Zombies) so I chose undecided to let chance decide which yarn I would receive. I got a beautify skein of Cashmere and Merino wool sock yarn and had to wait patiently for 10/1/2012 to start my socks. I decided to up the ante and am knitting the socks at the same time using the magic loop. I have never done this before but I jump into things with both feet and a dash of YouTube so hopefully the yarn knot gods are not against me. So far I am kinda pumped about this because I had a heck of a time getting a pair of socks done within a month for NerdWars so hopefully this is a fruitful experiment. So that is what's going on, betcha thought I designed super flowery socks didn't you? Got alot going on, anxious to see your superman square when it's finished. I was expecting a super-flowery-sock pattern. That's yummy sock yarn alright! Thanks. The pattern is on Rav but it's fiddly. But I don't think you can make the shape without it being fiddly. Heehee, "sock the vote" is adorable! I can also already tell that those socks are going to be stunning! Thanks I really love the yarn. It's a bright green, yellow and pink variegation.